Shares of Walt Disney Co (NYSE:DIS) are down 0.2% on the year. However, if you’ve seen the stock lately, you would think it’s much worse. DIS stock has fallen almost 10% from its 52-week highs made at the end of April. This is exactly the kind of pullback I like in high-quality stocks. Before writing at InvestorPlace, I was a strong advocate of Disney stock. It’s one of the rare companies that you can buy-and-hold and not worry much about. I was also a big supporter of buying at $100 or below when it was a bit more of a hot commodity. DIS stock’s multi-year trading channel hasn’t discouraged me though. It shouldn’t discourage long-term investors, either. It’s a Future Blue Chip stock — and arguably a current blue-chipper already. 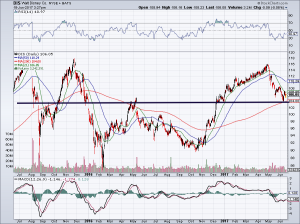 One reason we consider DIS stock a future blue chip is its dividend. Specifically, its dividend growth. 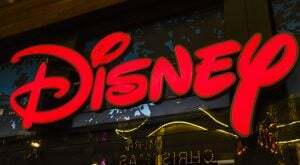 After paying out 35 cents per share in 2009, Disney has increased its payout some four-fold to $1.49 per share last year. Double-digit growth continued from 2009 to 2015. However, in 2015, Disney “only” grew the dividend 9.1%. While this is still good, a return to double-digit growth would be better. Sales will grow just 2% this year and 6.1% in 2018. Likewise, earnings are only forecast to grow 4% in 2017, but a much more robust 13.4% in 2018. Another plus to Disney stock? The valuation. Trading with a trailing price-to-earnings ratio of 18.5, it’s lower than Disney’s five-year average P/E ratio of 19.6. A forward P/E ratio of 15.4x isn’t bad either and is below the S&P 500’s 19.9x reading. Additionally, Disney trades roughly in-line with its peers from a valuation perspective. However, you could argue that Disney has a more attractive business and portfolio than the likes of CBS Corporation (NYSE:CBS), Twenty-First Century Fox Inc (NASDAQ:FOXA, NASDAQ:FOX) and Time Warner Inc (NYSE:TWX). One could truly make a case for both bulls and bears based on the valuation and growth profile. But one thing you can’t argue about is the brand. Disney has got one of the strongest brands and most diverse portfolios out there. Theme parks remain strong, with last quarter’s sales and net income up 9% and 20% year-over-year, respectively. Studio income also climbed 21% in the quarter. These positives were weighed down by the 3% drop in net income for media networks. And while Disney is surely struggling through subscriber issues with ESPN, the segment is still wildly profitable. Media networks generated $2.22 billion in operating income last quarter. Theme parks, an ownership stake in Hulu, ESPN, ABC, countless movies and franchises like Star Wars, Pixar, Pirates of the Caribbean and Marvel; these are just some of the company’s great assets. Sure, Disney can have a few rocky quarters, but it’s tough to argue with its strong portfolio. For long-term investors with a low risk tolerance or short-term traders, DIS stock has an attractive setup. 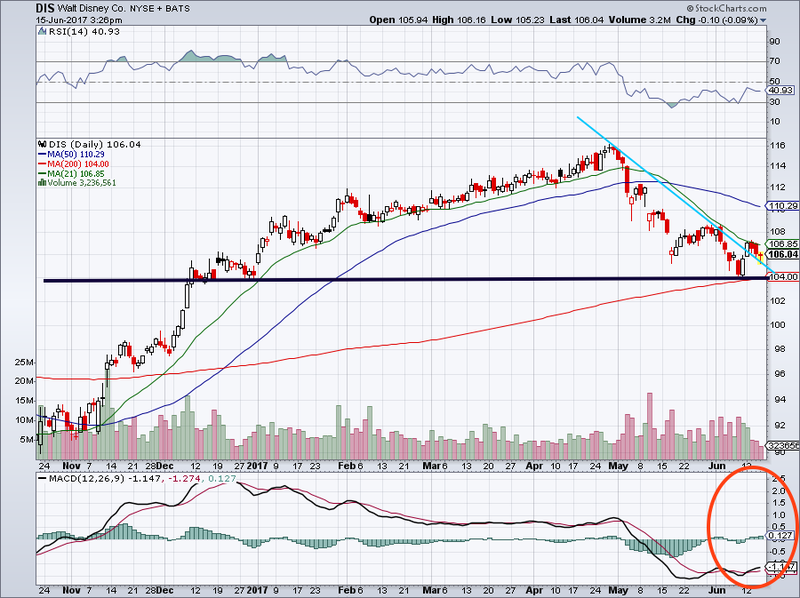 As seen on both the long- and short-term charts here, DIS stock is near an important level at $104. 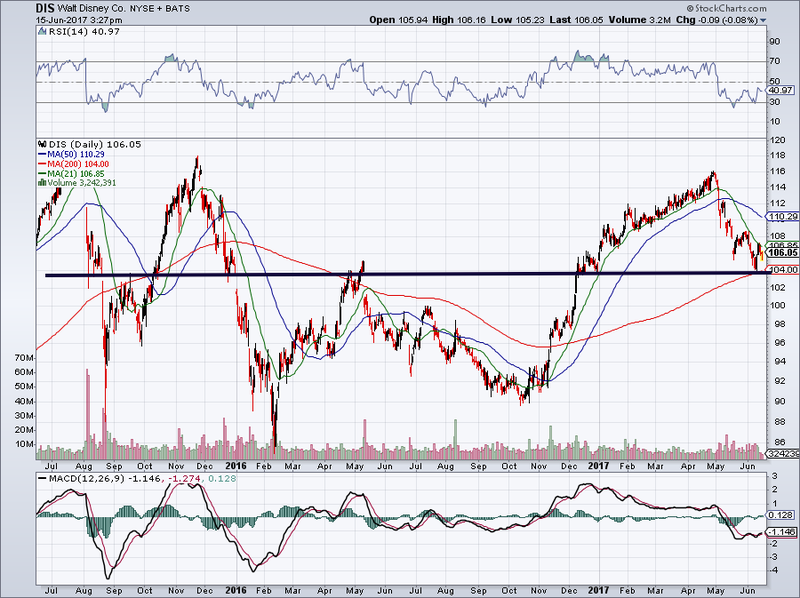 This area has been both support and resistance over the years. For investors who want to take a stab at Disney stock with a short leash, they can do so here. A stop-loss just below $104 can be used — which is also the level of the 200-day moving average. You’ll also notice on the short-term chart that the MACD (orange circle) is turning positive. 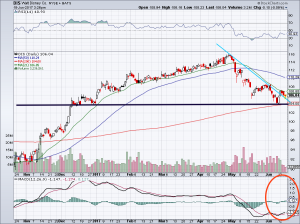 That’s good, as it shows Disney is regaining some bullish momentum. We want to see DIS stock get above its 21-day moving average. We most definitely want to see it hold above the blue descending line. If it doesn’t, support near $104 needs to come into play for the bulls to have confidence. Like we said above, there’s a lot of great reasons to like Disney if you’re a long-term investor. Whether it’s movies, franchises, theme parks or TV, this entertainment juggernaut has top-quality assets. But the short-term guys can have some fun with it too. For active traders, also consider how well Disney stock has held up given the recent volatility over the past week. In the case of Disney, both long-term and short-term investors can enjoy. Bret Kenwell is the manager and author of Future Blue Chips and is on Twitter @BretKenwell. As of this writing, he held a long position in DIS. Article printed from InvestorPlace Media, https://investorplace.com/2017/06/walt-disney-co-dis-stock-perfect/.